As we finish off the final slice of 2006, it seems like a good time to reflect on all that has happened in the world of bread this year, and what the future is likely to hold. Without a question the story of the year, at least online and in the English speaking world, was the New York Times article on No Knead Bread (a loaf of which is pictured above). This story set the blogosphere on fire, with dozens hundreds thousands of people trying out this technique. Experienced artisan bakers were a bit taken aback by the hype around this, since this approach isn't terribly new, but there is no question that this article inspired more people to try baking at home than anything had in many years. Which is great. World Bread Day also caused a stir online this year. Much of this was due to the work of Zorra in creating enthusiasm for this event. We'll see: perhaps next year it'll become an even larger event. 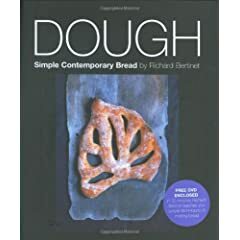 Dough: Simple Contemporary Breads won the James Beard Award for best bread baking book this year. I still haven't had a chance to read it. My impression is that it hasn't created the same kind of stir that The Bread Baker's Apprentice or Jeffrey Hammelman's Bread Book has, but it certainly worth looking at the next time you are in a bookstore. At the beginning of the year I used to have to pick through a lot of stories about the low-carb fad when looking for stories for The Bread Feed. I can't recall the last time I saw a low-carb story now. It has almost completely faded away, thank goodness. Replacing low-carb has been whole grain. While there is a faddish aspect to it, with even Wonder Bread releasing a whole grain version, overall it seems to be a more balanced movement, more of a return to our baking roots than something innovative and completely new. Professional bakers and home-bakers are trying to increase the amount of whole grain in their loaves without sacrificing taste, a welcome move, in my mind. Speaking of whole grain baking, in 2007 we look forward to the release of Peter Reinhart's book on whole grain and multi-grain breads. Many of the site members here have participated in the recipe tests he has been running. Everyone I have spoken to about it has been quite enthusiastic about the results. Traffic on this site is running four times as high now as it was at the beginning of the year. Community members have posted wonderful recipes, articles, and photos this year. I'm loathe to try to list them since I know I'll overlook many great posts, but a few of the good one I can recall include the whole wheat ciabatta, the the 50% whole wheat bread, the zucchini banana bread, an awesome bread machine whole wheat bread, the home-made croissant pictures as well as the harvest season photo contest. The list could go on and on. Please comment and link to some of your own favorites. Multiple professional bakers and cookbook authors have joined the site this year, but we've kept the environment comfortable enough that even brand new bakers feel welcome here. For that I thank everyone who has participated in the discussion here and shared their knowledge and enthusiasm with us all. Thank you Floyd for this wonderful site, which you are constantly tweaking! Your mentoring, sharing of recipes and pics of your very cute son! Happy & Healthy New Year to all ! Hats off to Floyd! Thanks so much for all the hard work you've done to make this forum such a welcoming and vibrant space! I found this site in 2006, so it's a plus on my annual review. Thanks for all the work you do. This site has been a teaching tool and an inspiration. In just a few months I've progressed from a hesitant attempt to use a second-hand bread machine to baking 4 loaves of french-type crusty bread last night for 15 of my in-laws! What a rush! Thank you, Floydm, for an awesome site. Thanks also to those who contribute their expertise and observations. I always feel at home here. The recipe wasn't anything special. Just a very slack dough, with around 80% hydration, and very little (like a quarter of a teaspoon) yeast. Mix it, don't knead it, then let it rise for 18+ hours. Fold, let rise 2 hours, then bake in a pot. Floyd, I must add my thanks to the long list of Fresh Loaf users who are so grateful to you for creating and steering this wonderful site. Thanks to you, I have discovered a delightful, satisfying hobby and become quite the bread-lady among my friends and neighbors. Every time they wax enthusiastic about one of my loaves, I credit this site. It is, as everyone has said, inspiring and educational. It's also the friendliest spot in all cyberia! Here's a virtual toast to all you have done this year, and wishes for many more!